Image 1: The classical Cesarean incision allows for a larger delivery area, but tends to form more adhesions. Nerves live for motion and relish the ability to slide and glide. If a nerve runs through impaired muscle, fascia, or visceral tissue, the entwined nerve can be pinched or pulled by the fibrous scar, causing pain signals to be sent. For example, scars sometimes grow long, tentacle-like strands called adhesions. It’s not uncommon for the adhesions from a Cesarean-section scar to entrap nearby hypogastric and pudendal nerves feeding the bladder and urethra (Img. 2). This, in turn, may cause referred nerve pain that mimics, and is often treated as, cystitis. Consequently, when a woman’s fingers press firmly on a C-section scar, she may experience urethral burning, urgency, or frequency. That’s why it’s important to remember that pain caused by a scar may be referred far from where the scar is located. Moral of the story: don’t chase the pain. Image 2: Classical Cesarean section with adhesions impinging on hypogastric and pudendal nerves. At the Vancouver International Fascial Research Congress Raul Rodríguez, PT, DO, presented a fascinating clinical video of himself treating a bullfighter who had suffered a nasty scar after he was gored through the thigh. The audience of 800 watched as layers of fibrous, crosslinked connective tissues began to glide as Rodríguez’s trained hands manipulated the adhesive layers. Image 3: Epidural fibrosis occurs postsurgically as scar tissue binds nerve root to bone. But injury is not the only cause of scar tissue. In clinical practice, we commonly palpate fibrous connective tissues associated with plantar fasciitis, tennis elbow, and rotator cuff pain. 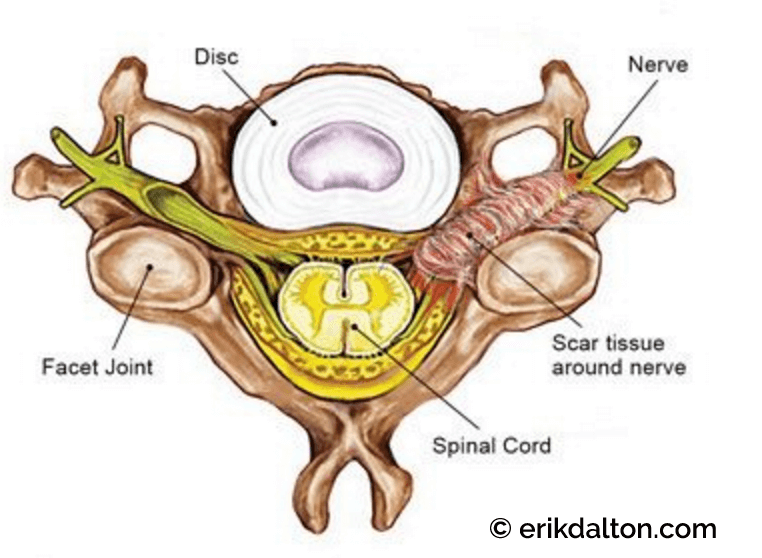 When scar tissue arises near a nerve root, it is referred to as epidural fibrosis (Img. 3). This is a frequent occurrence in those experiencing failed back surgeries. Image 4: Searching for adhesions, the therapist’s fingers and thumb guide under the scare working the tissue in opposing directions. Image 5: To release entangled nerve and intestines, therapist’s curled fingers hook and scoop fibrous adhesions anteriorly. Adhesions are bands of scar-like tissue that form between two surfaces inside the body and cause them to stick together. When the scar extends from one tissue to another, usually across a virtual space such as the peritoneal cavity, the body deposits fibrin onto the injured tissues. The fibrin acts like a glue to seal the injury and builds the fledgling adhesion. At the sites where abdominal adhesions occur, scar-tissue tentacles sometimes grab a piece of the small intestine. As internal pressure causes the intestine to twist and tangle on itself, peristaltic action is stalled and the putrefaction process begins. Adhesions require treatment because the body has no mechanism for mobilizing these strands of scar tissue naturally. Although the body can sometimes adapt and tolerate a certain amount of adhesive scar tissue, it will fail to function optimally, predisposing itself to repeated injury. There are many types and styles of manual therapy for the treatment of adhesions. Clearly, the sooner therapy begins, the more effective it will be. Semifresh scars respond more quickly to treatment, but hope still exists for old injuries, too, as seen in Rodríguez’s brilliant sonoelastography demonstration. The goal is to restore function to inflexible tissues and normalize cellular and organ metabolism. Much like the stretching and torsional maneuvers used by Rodríguez on the injured bullfighter, hands-on modalities using varying degrees of pressure and depth may also help soften and functionalize tough, fibrous connective tissues resulting from an abdominal scar. In Img. 4 and Img. 5, fingers and thumbs search for underlying adhesions and slowly work to free entrapped nerves responsible for referred pelvic pain patterns. To speed recovery, teach your clients how to perform these simple techniques at home.chniques at home. Jonathan A. Sherratt, “Mathematical Modeling of Scar Tissue Formation,” Department of Mathematics, Heriot-Watt University (2010). Raúl Martínez Rodríguez and Fernando Galán del Río, “Mechanistic Basis of Manual Therapy in Myofascial Injuries. Sonoelastographic Evolution Control,” Journal of Bodywork and Movement Therapies 17, no. 2 (2013): 221–34.